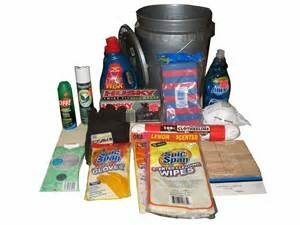 These are flood buckets, you fill them with cleaning supplies and disinfectants, rubber gloves, sponges, flyspray etc. They will be sent to Houston via our church (Methodist). June Chism and I went to Kerrville Home Depot and filled one each. Home Depot people sent a guy to go with us to find all the stuff on the list. Adds up to about $80.00. As I was checking out there was a woman behind me who was very taken with the idea, said she had not heard of it but wanted to do one as well. I told her to get in contact with her local church as that is who is collecting and sending down most of them. She said she was going to do just that. Then my old friend Doug Rodger in Canada e-mailed me and said he wanted to send the money for me to fill another and so I will. I have to go to Bandera today for several things and will do another flood bucket for Doug. UMCOR does require that all patriotic symbols be removed from the kit contents. For example if an item in a kit has a stamp that contains the American flag that stamp must be removed, covered, or blacked out. So June and I stopped at a Hobby Lobby and bought a whole lot of American flag stickers and plastered them all over both buckets, top and sides. For Doug’s bucket I will put a Canadian flag on top. Eat unspeakable wastes, cruel snobbish fiends. This entry was posted in News on August 31, 2017 by admin.